CNG: eAuction 438. GALLIA LUGDUNENSIS(?). Æ Sestertius (36mm, 23.83 g). Countermark applied during the reign of Nero, AD 54-68(?). 438, Lot: 328. Estimate $200. GALLIA LUGDUNENSIS(?). Æ Sestertius (36mm, 23.83 g). Countermark applied during the reign of Nero, AD 54-68(?). 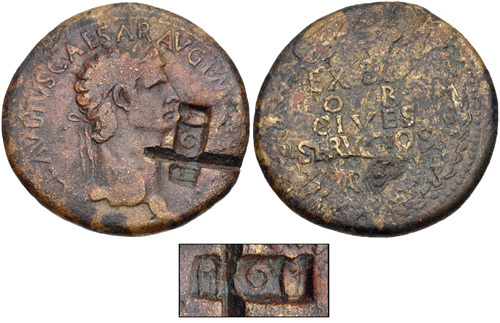 PROB(atvm) in a rectangular countermark on a bronze sestertius of Claudius. Pangerl 23. Host coin Good Fine, c/m VF, brown patina, cut over countermark (cancellation?). A similar countermark was also applied in Hispania, though the Gallic type can be distinguished by the high top on the letter P.